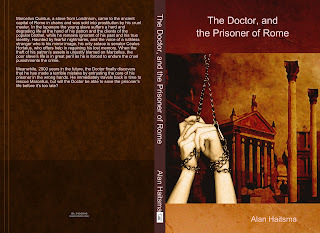 A while ago, I've written a novel based on the Simm!Master and the 10th Doctor (who-else). For those who are interested, it's available at LuLu.com in PDF. The download is free for everyone. Marcellus Quintus, a slave from Londinium, came to the ancient capital of Rome in chains and was sold into prostitution by his cruel master. The young slave suffers a hard and degrading life at the hand of his patron and the clients of the popular brothel, while he remains ignorant of his past and his true identity. Haunted by nightmares, and the voice of a ruthless stranger who is his mirror image, his only solace is senator Cealus Hortalus, who offers help in regaining his lost memory. When the theft of his patron’s assets is unjustly blamed on Marcellus, the poor slave’s life is in great peril as he is forced to endure the cruel punishments for the crime. Meanwhile, 2000 years in the future, the Doctor finally discovers that he has entrusted the care of his defeated arch-nemesis in the wrong hands. He immediately travels back in time to rescue Marcellus, but will the Doctor be able to save the prisoner’s life before it’s too late? Warning: Contains adult content. Not suitable for readers under 18. Great job with the books, just what I've been waiting for. I want to buy your books in paperback form but i can't quite see how to do that at Lulu.com. Any help? Thanks for your support! I appreciate that. I'll open the paperback options again for you. They will be available at Lulu.com at the same link for the coming 7 days. After that, I will close it down again, but this should give you enough time to order. Once it is placed, it will be processed as normal. I'm sorry for closing the paperbacks down, but I don't want to get in trouble with the BBC who don't want me to actually sell these because it's in breach with their copyright. I made this available at LULU.com because a large number of readers from my stories which I post on forums encouraged me to bundle the stuff into a more desirable format (it's hard to find when it scattered in a gezillion posts). The paperback option was more for my mom and my family and some close internet palls who wanted a copy. That's why I removed it after Christmas because everyone got one by now and mine is safely stored on my bookshelf. But I don't mind opening it for you again. Glad to be of service! NB: I must also apologize for the price in advance, but because LULU is a print on demand service, the books that you order are printed not in bulk but per order, which makes the price per printed page a bit stiff.